One of the favorite dishes in Azerbaijan is Kebab, which is lamb strung on skewers and fried on a barbecue using the smoke from burning coals. When cooking lamb chops, the most important part is to marinade them. The lamb tastes so good on its own, so the seasoning should just compliment the lamb. Here is the simple marinade for lamb chops. Slice the onion, put it in a bowl and add ½ teaspoon of salt. Massage the salt into the onion and squeeze it with your hand until the onion gets soft and a little juice will come out. Rub the lamb chops all over with salt, pepper and coat with onion. Put them in a plastic bag. Seal the bag well, to prevent any leakage, and marinade overnight in refrigerator. 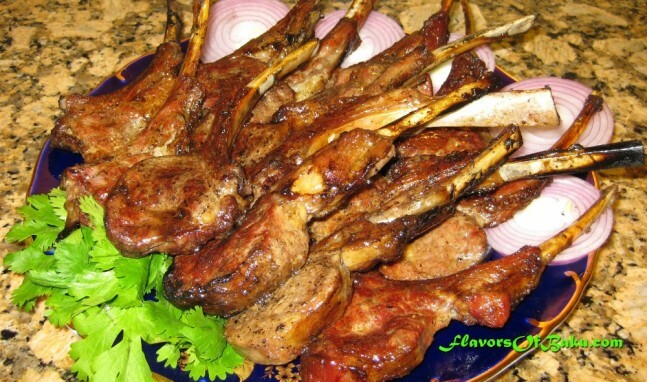 Remove the lamb from refrigerator to 1 hour before grilling, and remove all onion from the chops. Cover the onion with pomegranate juice (vinegar, or lemon juice) and serve with kebab.